Belgravia Green, a brand new cluster strata housing project will launch soon. This project is on the fringe of Seletar Hills estate, but the main entrance is at Belgravia Drive, along Ang Mo Kio Ave 5. The Belgravia Green Showflat is likely to open for viewing sometime in mid-September 2018, at around the same time as Parkwood Collection does. This development enjoys freehold land tenure. 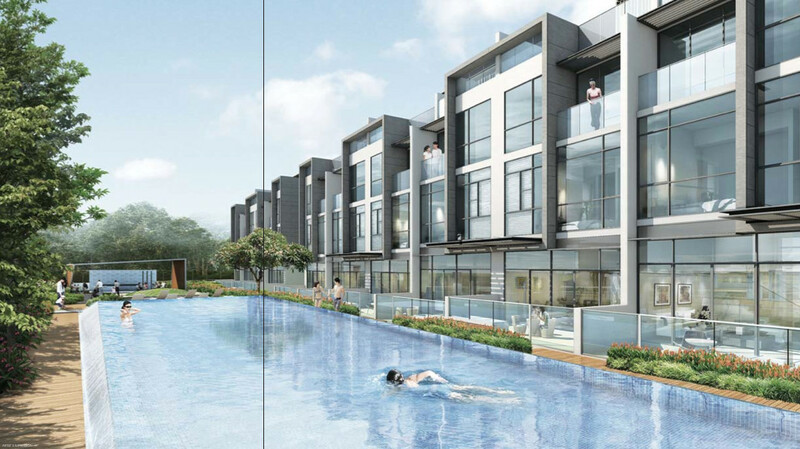 Belgravia Green offers a mix of landed house living with condominium facilities. The best part is that maintenance of the building exterior and landscaping is taken care of for you. The main drawback of this project is that it is not within walking distance of a shopping mall or food centre or MRT station. But this is true of most landed housing, and the trade-off for the exclusivity and quieter environment that they afford. Also, it is expected that those who live in landed housing estates generally drive anyway. The developer for Belgravia Green is the Tong Eng Group, a local developer that has been in the property development business for quite a while. They actually developed the first phase of the Belgravia Collection, Belgravia Villas that sold out some time ago. Belgravia Green will be the 2nd phase of the Belgravia Collection. The Belgravia Green floor plan layouts are beautifully designed, easily one of the best and most efficient layouts for cluster houses around. Very good sized rooms, especially the bedrooms, functional layouts with little wasted space, and very logical flow of space. They have obviously learnt from aspects at Belgravia Villas that buyers didn't like, and have used those lessons well. Like most cluster house developments these days, the bulk of the units in Belgravia Green are provided with a home lift. But a small number are deliberately designed without lifts, to cater to buyers who have previously said they did not need it, and did not want the trouble and expense of maintaining one. The prices for the terrace units without lifts should be slightly lower than those with lifts, and highest for the semi-detached units. Thank you, Arcachon. I will check. Could that be the site area for the whole Belgravia Collection? Cos the site area given by the developer in their fact sheet for Belgravia Green was 12,687 sqm / 136,562 sqft. Thanks again, and have a great week. Latest Update on Belgravia Green: this project is targeting to launch VIP Preview soon. Earliest possibly first week of October 2018. The perspectives have just come out. The design tends towards a contemporary look, lots of glass windows. Each unit comes with 5 bedrooms (most of them ensuite), a roof terrace, and a helper's room. Fittings for Belgravia Green are not too bad - brands like De Dietrich, Hansgrohe, and Kohler. Smart Home system from FIBARO. Those units with private home lifts will be given free maintenance for the first year. All times are GMT +8. The time now is 08:33 PM.